The Big Agnes Copper Spur HV UL2 is one of our all-time favorite backpacking tents and one of Big Agnes’ best selling designs. The Copper Spur strikes an excellent balance between weight, livability, convenience, and weather protection. It’s a great choice for backpackers wanting to keep their packs light without giving up convenience and comfort. We think the Copper Spur HV is one of the highest quality freestanding tents on the market, so if you’re looking for a new tent, we highly recommend putting it on your list. 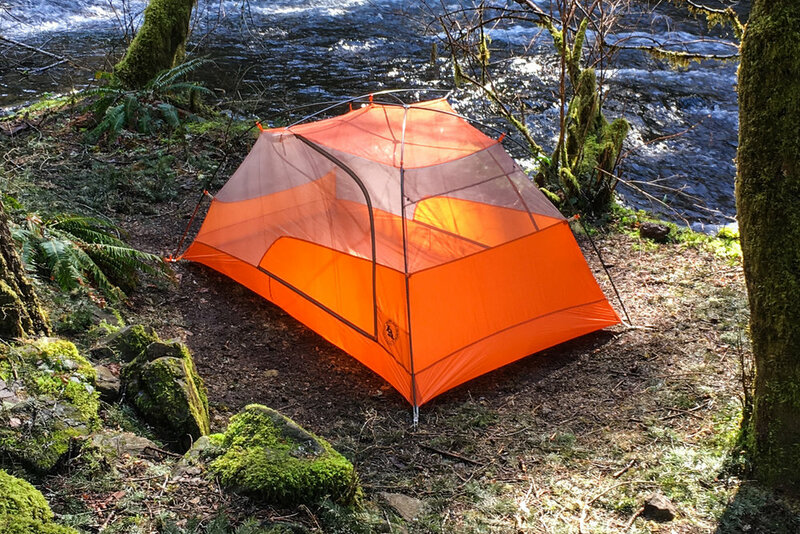 Note: The Copper Spur HV UL2 earned Best All-Around Tent in our Best Backpacking Tents List. 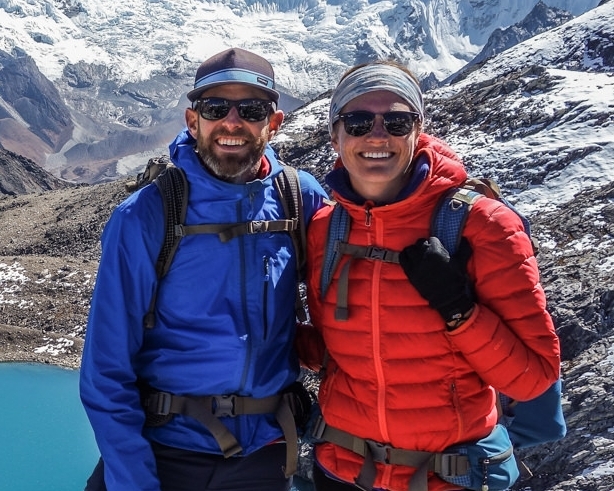 Check out the CleverHiker Gear Guide for our other favorite backpacking equipment recommendations (backpacks, sleeping bags/pads, stoves, etc.). Price: The Copper Spur is not a budget backpacking tent, but in our opinion it’s well worth the cost if you put it to good use. The Copper Spur is one of the lightest and highest quality freestanding tents on the market, and as is often the case, you get what you pay for. To see if it’s in your budget, find current pricing for the Copper Spur HV UL2 here at REI, Amazon, Backcountry, Campsaver, and Moosejaw . If you’re willing to carry more weight for a lower-priced tent, check out our top lightweight tents list or our budget backpacking tents list. Weight: The Copper Spur HV UL2 is among the lightest double-wall freestanding tents on the market, which is a big win in our books. It’s packed weight is 3lb 1oz (including stakes, guy lines, etc. ), which is very light for a two-person freestanding tent, especially considering the interior space of the Copper Spur. Carrying a lighter overall load has a ton of benefits, but simply stated, we find lightweight backpacking to be far less exhausting and much more enjoyable. Freestanding: The Copper Spur is a fully freestanding tent, which means it’s main body can be pitched almost anywhere. This type of design is extremely convenient, quick to set up, and can come in handy when pitching on hard ground or solid rock. The shape of the Copper Spur is asymmetrical, with more room at the head of the tent, but it’s clips and poles are color coordinated to make setup nearly foolproof. Living Space: Interior space is another key highlight for the Copper Spur. It’s bent-pole structure and top crossbar create nearly vertical sidewalls, which provides a lot of headroom. The UL2 has enough space for two regular-width sleeping pads lying side-by-side and a small stuff sack or two stored by your head. Your backpack, shoes, and any wet gear will easily fit in the medium-sized vestibules. The Copper Spur HV comes in four different sizes: 1-person, 2-person, 3-person, and 4-person. What size you choose may depend on your backpacking style. If you prefer hiking light and crushing miles, stick with the listed model (example: get the UL2 to sleep 2 people). If you’re willing to carry more weight for increased interior space, you may want to bump up one tent size (example: get the UL3 to sleep 2 people). 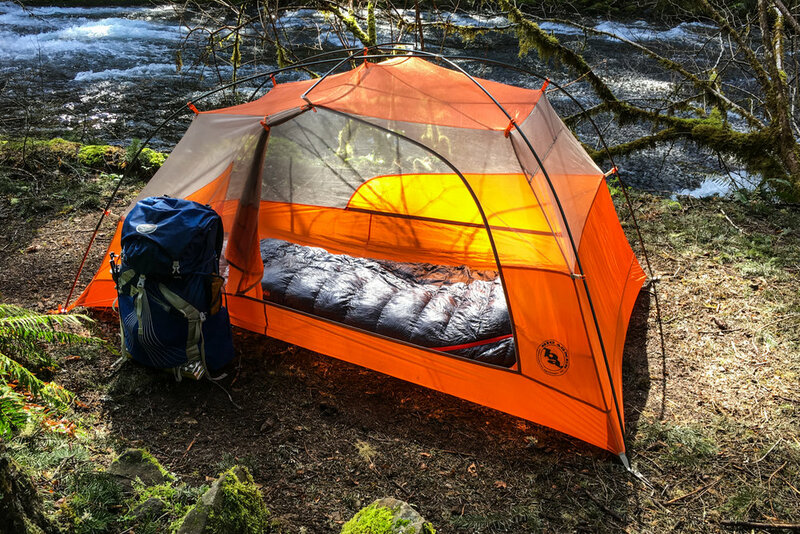 Seasons: The Copper Spur is a 3-season tent, meaning it will work well under most spring, summer, and fall backpacking conditions. The Copper Spur can handle a light amount of snow, but it’s not designed to be a winter backpacking tent. Weather Protection: We’ve tested the Copper Spur throughout the Pacific Northwest in very wet conditions and it has performed well, keeping us bone dry inside while pouring rain outside. As far as wind resistance goes, tents like the Copper Spur (spacious, double-wall, freestanding) tend to perform worse than low-pitch pyramid tarps/tents, but we feel the Copper Spur will still withstand a good amount of wind exposure, especially with the four storm guylines staked out. That said, you should always limit your wind exposure when choosing a campsite, regardless of your shelter. Durability: The floor and rainfly of the Copper Spur are made with 20-denier silicone impregnated ripstop nylon. The “denier” denotes the thickness of the fabric, and 20d is on the thinner side for tent floor fabrics, though not as thin as some ultralight tents using 10d or even 7d nylon. This fabric is a big part of why the Copper Spur is so light, but it does slightly reduce its long-term durability. 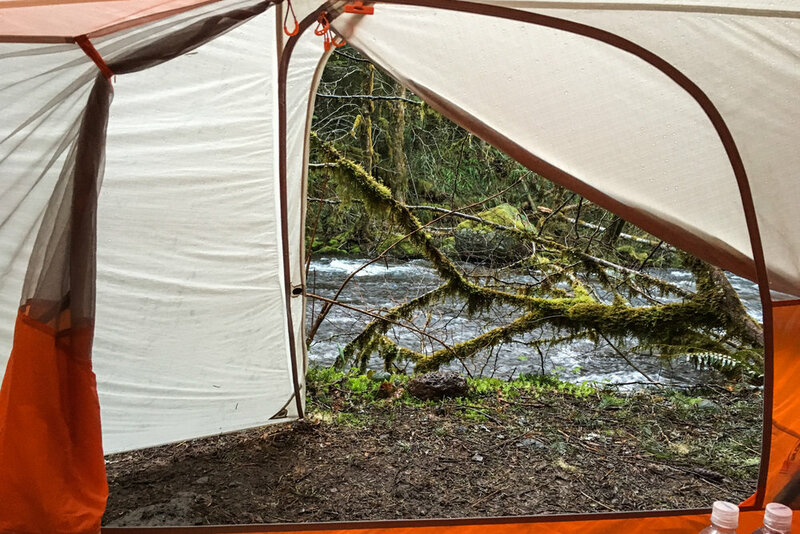 If you’re hard on backpacking gear, this might not be the best tent for you. That said, the Copper Spur is a popular choice among thru-hikers of the AT, PCT, and CDT, all of which are notoriously tough on gear. It’s important to remember that a sharp stick or rock will puncture almost any tent floor and small rips/holes can easily be repaired with tenacious tape. In our opinion, if you take good care of this tent, it should last for many years and thousands of miles. Also, if you're nervous about tent floor durability, you could pick up the Copper Spur HV UL2 footprint (more info below, sold separately, 6 oz). Walls: The Copper Spur HV is a double-wall tent with a top crossbar to help make the sidewalls nearly vertical. Double-wall tents are preferred by many backpackers because they create separation between the mesh tent body and the rainfly. In wet conditions, it’s common for condensation to build up on the inside of a tent rainfly and the mesh barrier will help keep you from rubbing up against it. Doors: The Copper Spur HV UL2 has two large side doors and vestibules that are easy to open and pin back for ventilation. This design is excellent, especially for multiple users. Having separate entrances will ensure that you’re not climbing over a tentmate and two sets of gear every time you want to get in or out of your tent. Vestibules: Each vestibule on the Copper Spur provides about nine square feet of space. One stake is used to guy out each vestibule and we think this design is excellent. The vestibules aren’t huge (we’d say they’re medium-sized), but they provide plenty of room for your backpack and any gear you want to keep protected at night (shoes/boots, wet jackets/pants/clothing, etc.). Pole Structure: The DAC featherlite pole setup for this tent is easy to use, sturdy in rough weather, and keeps weight to a minimum. The poles are also color coordinated (orange pole tips fit with orange tent tabs), which makes pitching the asymmetrical Copper Spur really easy. We love the simple pole structure of this tent and wonder why more manufacturers don’t use a minimal yet sturdy design like this. Rainfly: The rainfly on the Copper Spur is made of lightweight 20d silicone impregnated ripstop nylon. The material feels very light and is fully waterproof. One downside with sil-nylon rainflys is that they sag a bit when wet and cold (when it rains for example). While this won’t affect the weather resistance of your tent, you may want to re-tighten your rainfly when temps drop for a completely taught pitch. Zippers: Two zippers open each main body door on the Copper Spur (one zipper along the bottom and one on the top). This makes each door easy to open and close, even with one hand. 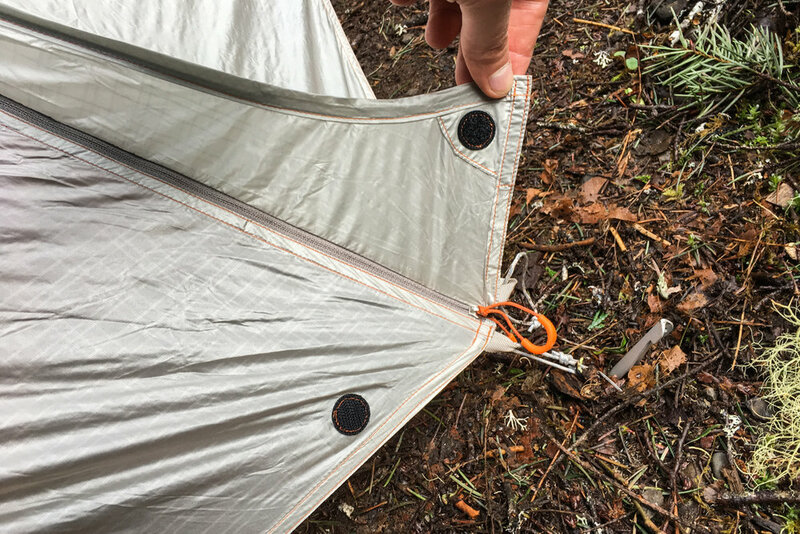 The rainfly zippers on the Copper Spur do have a tendency to snag on the storm flaps at times, especially when wet (we find this to be a common tent problem). This is easily avoided with the use of two hands and a little care, though we do see it as a small downside. Ventilation: The Copper Spur has one large top vent on the rainfly which helps keep interior condensation to a minimum. The vent has a velcro stay that can easily be opened and closed. This is a quality design feature we really like. Pockets: The Copper Spur has three well designed and useful pockets. Each side has a rectangular pocket by the head and there’s one large rectangular top pocket as well. This isn’t the most important detail in a tent, but these pockets are very convenient, and we think they’re some of the best of any tent we’ve tested. Guylines & Clips: The guylines for the Copper Spur come attached and ready to go, which is a great convenience. They’re also reflective to help avoid nighttime stumbles and they have adjustable line tensioners attached. The rainfly is connected with color-coded buckle clips, which make it easy and fast to deploy. This attention to detail is one of the reasons the Copper Spur is such a high quality product. Footprint: The Copper Spur HV UL2 footprint is sold separately and weighs 6 ounces. A footprint will protect your tent floor from abrasion, so your tent will last longer and need fewer repairs, but they’re not required. We often backpack without them, but if you’re willing to carry a little extra weight to extend the life of your tent, consider picking one up. The Big Agnes Copper Spur HV UL2 is one of our all-time favorite backpacking tents and we recommend it to friends and family all the time. We love getting the comfort, convenience, and weather protection of a freestanding, double-wall tent in such a lightweight package. If you’re a backpacker looking for balance between camp comfort and trail weight, the Big Agnes Copper Spur HV UL2 is an excellent choice. If you’re willing to carry a bit more weight for increased interior space, we also really like the Copper Spur HV UL3. We purchased the Big Agnes Copper Spur HV UL2 with our own funds and we are under no obligation to give it a positive review. Some of the links on this page are affiliate links, which means we may receive a small commission if purchases are made through those links. This adds no cost to our readers and helps us keep our site up and running. Our reputation is our most important asset, which is why we only provide completely honest and unbiased recommendations.